We were delighted to welcome 35 local primary pupils with their parents/ carers to our third Family Science Day on a bright, sunny Sunday in March. 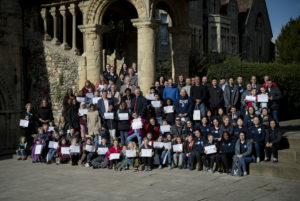 The pupils who attended were in year 5 or 6 from 9 primary schools across the Canterbury area. We were also pleased to be joined by the Lord Mayor and the Lady Mayoress (Councillor and Mrs Spooner), Councillor Michael Northey from KCC and Frances Judd QC, a King’s School governor. 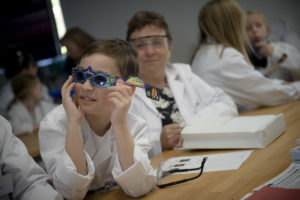 The families were met by our volunteers and collected their lab coats, ready to take part in a carousel of three science activities from our Biology, Chemistry and Physics teachers. Transport from the schools was provided and younger siblings were able to come along and join our creche whilst their parents/carers and older brothers and sisters had some science fun. All the sessions were run by our fantastic science specialists and helped by our wonderful King’s School volunteers who had given their Sunday to help out. In the Physics session families made pinhole cameras and parents and children alike enjoyed the chance to make something amazing together. Our chemistry lab session was entitled “colours” and the attendees looked at the periodic table and how elements burn differently. 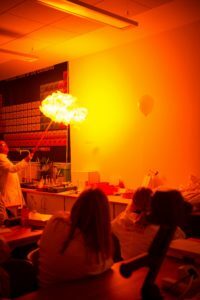 The children and adults were excited to use the bunsen burners and it was a very popular session with lots of hands on experiments with a finale with 3 exploding balloons. The third part of the carousel was in Biology led by the ever enthusiastic Dr Doreen McVeigh. Her session on Daphnia and Hydra fascinated our visitors who loved learning about these amazing, tiny creatures looking at them through microscopes and then ultimately feeding the Daphnia to the Hydra! After everyone had completed the three sessions we all headed up to our main dining hall where our catering team had prepared an amazing lunch. This was followed by speeches and a presentation of certificates to the children by the Lord Mayor. Our volunteers worked very hard all day at the event and many people commented on how helpful and kind they were and enjoyed having a chance to chat to them over lunch. 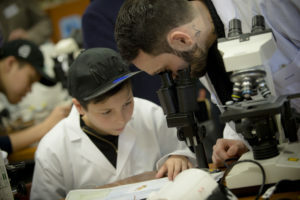 We’re looking forward to planning next year’s Family Science Day and welcoming many more families into our King’s School laboratories.